سواءً كنت مسافراً بغرض السياحة أو العمل, Wai Ora Lakeside Spa Resort هو خيار عظيم للإقامة خلال زيارتك روتوروا. يسهل الوصول إلى هذا الفندق ذو 4.5 نجوم من المطار، فهو يبعد عنه مسافة 0.6 km فقط. كما يمكن الوصول بسهولة إلى مطار روتوروا, ‪Sulphur Point‬, ‪Arawa War Memorial Statue‬. يقدم Wai Ora Lakeside Spa Resort خدمات لا غبار عليها وكل أشكال اللياقة وحسن الضيافة اللازمة لإسعاد ضيوفه. هذه بعض الخدمات الموجودة في هذا الفندق: خدمة الغرف على مدار الساعة, واي فاي مجاني في جميع الغرف, مرافق مخصصة لذوي الاحتياجات الخاصة, تسجيل وصول/خروج سريع, تخزين الأمتعة. ادخل إلى واحدة من الغرف 30 وتخلص من عناء نهار طويل بمساعدة مجموعة كبيرة من الخدمات كمثل تلفزيون بشاشة مسطحة, قهوة فورية مجانية, شاي مجاني, بياضات, مرآة الموجودة في بعض الغرف. يقدم الفندق مجموعة رائعة من الخدمات كمثل حوض استحمام ساخن, ساونا, حمام سباحة خارجي, سبا, تدليك، لجعل إقامتك تجربة لا تنسى. اكتشف مزيجاً ساحراً من الخدمة الاحترافية والخيارات الواسعة من وسائل الراحة والمتعة في Wai Ora Lakeside Spa Resort. Dear manager is very rude for you to call at 10:46 PM to see if I paid for dinner or not, that’s your problem to know and you woke up my infent. The hotel is also full of bugs. It’s the worst hotel I have been in my entire trip to new zeland. Kayla and Nikola provided such a warm welcome. The room was comfy and clean and I took advantage of the jacuzzi/hot tub twice during our stay. 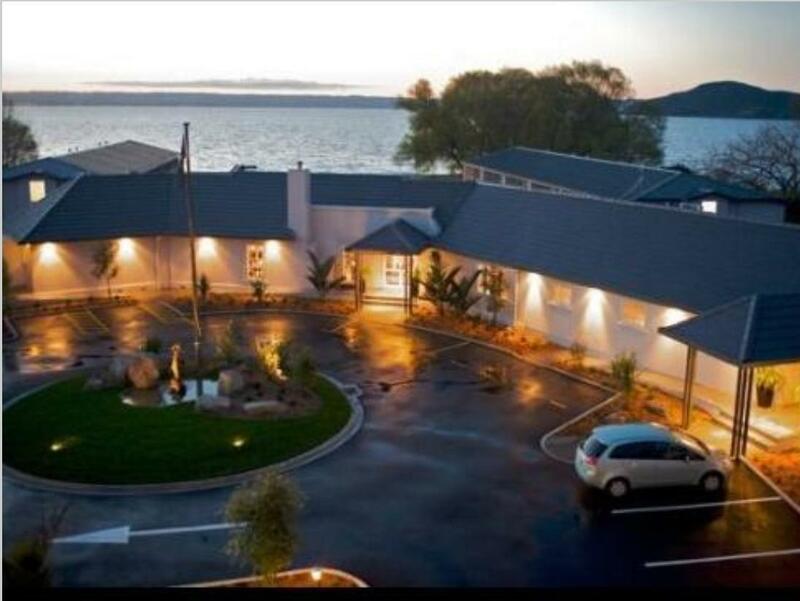 I would stay here again and would recommend to friends and family for their visit to Rotorua. Very close to the Redwoods Treewalk which we thoroughly enjoyed as well. Missed experiencing the Spa this visit because it was booked due to a conference occurring same time. We stayed in rooms 19 and 20 and enjoyed the privacy and close proximity to lake. I must say the team were exceptional in personal service. Young man in the Restaurant David Potts excellent Ambassador for New Zealand.. Reception Front Office team which and International mixed group of people went the extra mile for us.. Rooms nicely appointed very clean..
We have stayed in this resort during one of the weekends in October 2016. 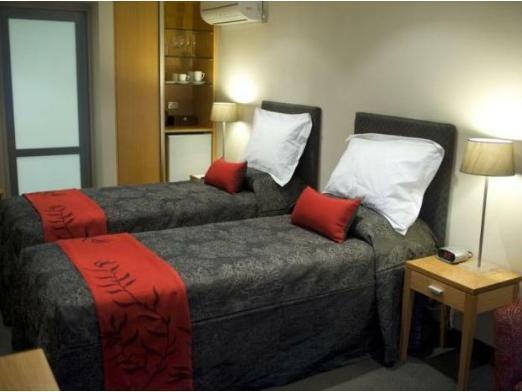 Our booking was absolutely last minute - as we really didn't plan to stay overnight in Rotorua, but it was getting late and we decided to book a place. So booking was done literally 2-3 hours before we came to check-in & gladly we had no problems with that. 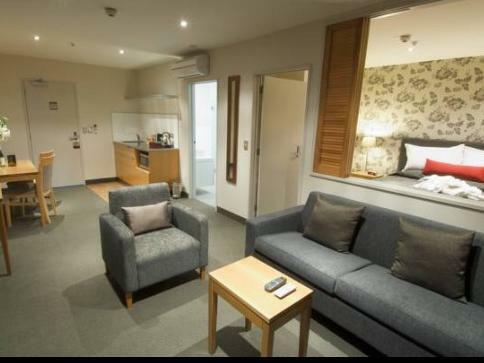 The rooms price was about $160 (deluxe studio). The room itself was fairly big and reasonably modern. I would say that the shower was spacious as well, but no bathtub. There were chairs outside of the rooms - sort of like a balcony deck, some of the guests were smoking there, and the smell actually sipped into the room a little. That wasn't that great, but you can live with it. Would be better to have a separate dedicated area for smokers though. The real plus in the hotel for me was hot bathtub and hot mineral pool as well as cold pool as part of the facilities. And of course a central location. We also ordered room service which came quite fast, the presentation of food was great and beef main course was really nice. I wasn't impressed with prawn and scallop started. Overall I would rate this resort 5.5-6 out of 10. 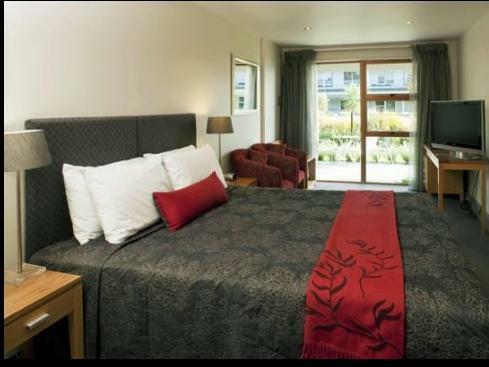 But it's definitely so much better than Grand Rotorua hotel. Everything was good, we hope to stay in this hotel one day in the future again. It's located quite far from the city center/local restaurants in Rotorua, so you need a car to be able to reach those locations. However, this is not a big issue, as the hotel has its own nice restaurant. Hot tub was so luxurious, great view, super nice staff, loved it! Everything was very good including food, room and spa. A few miles from the town centre which wasn’t an issue for me. The sauna pool and the barbeque facility is a plus point. Excellent hotel with friendly , helpful staff. The good - Great staff. Jeslin was very helpful. Good location near the lake and airport. Nice mineral water pool and tub. Clean and large rooms. Keep it up guys. Cons- Limited and expensive food options and town is far away. Over all highly recommended if you are mobile. We had a great time in Wai Ora. I want to make a comment to the Wai Ora owner to hire more staffs. We arrived at Waiora in late night and there was a duty manager who was helping other customer to cancel their booking. There was no other person who can help us so we were waiting about 20 mins, after our checking in, same duty manager helped us to go to our room. When we had dinner after unpack our bags, she was also doing some serving job in the restaurant. We were wondering now if she was cooking in the kitchen and everywhere. Seriously facility was fine, linen was fine (which is very important for us since my kid is in dust mite allergy), room condition was fine, bathroom was great, tasted of food was good. I just concern with the number of employees. One more thing, there are full of lake flies outside of the room, so we had to run while going to our room from the reception. Once we get to our room, we were okay. Looking for a place away from the busyness of town? You can't look past Wai Ora. From the moment we checked in, the staff were friendly and welcoming. We had a great time in the onsite hot tubs and dining at the in-house restaurant for dinner is an absolute must! Overall good value for money. Friendly staff, Restaurant was a bit pricey and portions small though. Rooms have ranch sliders to enter, but no other windows for light. The spa facilities were good. Perfect place for relaxation and rejuvenation, very fresh and well kept and so friendly, kind and helpful staff who really did everything to make my stay pleasant. 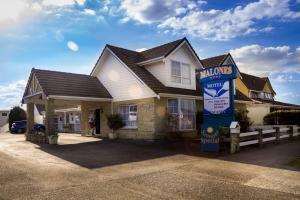 Beautifully located by the lake and relaxing hot mineralbaths. I will come back. Every single member of the staff was friendly and helpful. The restaurant is incredible. The setting is perfect with beautiful views of the lake and a public lakefront walk that led to an amazing nature preserve. Location is unbeatable. We were able to do easy day trips to the hot springs and even the coast line and , it's far enough from, but close enough to town that you could have both peace and convenience. We loved it so much we stayed an extra day. Nothing particularly bad with the Wai Ora Lakeside. It is on the side of the lake, there is a hot tub or too, a sauna & steam-room. The beds are comfortable and the rooms were quiet. There's nothing particularly great about it either. It's a long way from town, there's nothing other than a McDonalds in proximity. It's way over-priced.